And for this fight, we go to the cradle for HANSON! Do you hate things that look like girls and have voices that sound like chipmunks? 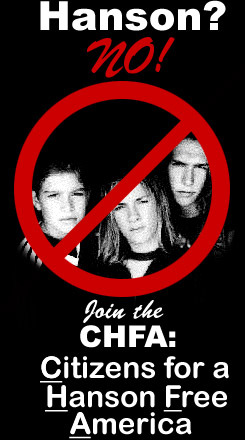 And THAT is why I have decided to wage war against the Hanson brothers. You know the drill...first we will discuss some advantages. 1. Bob can pull their hair. 2. Bob can run them down with a train. 3. Bob can hit them with a spatula. 4. Bob can get them in trouble and have their mom spank them. 5. Bob can push them off the swings. 1. Hanson can scare Bob to death with their singing. 2. Hanson can emmit loud, high-pitched squeals to drive Bob insane. 3. Hanson can show Bob the video to "MmmBop" and reduce her will to live. 4. Hanson can hit Bob with their instruments. 5. Hanson can tie Bob to a chair and make her listen to their CD. Bob: Wow. I am really tired after all that hassle with those Spice Twerps. I need some calming music. Bob: Ahh...some nice peaceful Oasis. I think I'll just lie in my hammock, with my lemonade, listening to this delightful stuff. Radio DJ: We now bring you a new selection from the wonderful Hanson brothers! Radio DJ: Hanson was one of our most requested artists today! Radio DJ: Yesss! That's right folks! Radio DJ: And heeeeeere's MmmmBop! Bob: STOP! STOP SINGING! PLEASE! Bob: Wow. Adrenaline does great things. Bob: IT'S POSSESED! SAVE ME!!! Bob: Ack! I knew that thing was evil the minute I bought it! Bob: BACK, EVIL THINGS! Or I shall beat you down with my SPATULA! Zac: Oooooh a SPATULA! Watch out guys! It might hit you and then you would die! Bob: (Politely)Excuse me. Did you just insult my spatula? Sports Announcer #1: Oooh, Ladies and Gentlemen, it's a hit to the Hansons with Bob's spatula! Oooh that's gotta smart! Sports Announcer #2: That's right, Randy, the Hansons are reeling! Sports announcer #1 OWCH! That's got to HURT, people! The Hansons just smacked Bob with a keyboard! Sports announcer #2 Bob is reeling....But she's coming back with her trusty spatula! WHAP! BOOM! ZONK! KRETCH! BLAMMO! BANG! SMACK! Sports announcer #1: I do believe Bob has beaten the Hansons! Medic Man: The Hansons have all flatlined! We're not going to recusitate them, however, as it would be a crime against modern humankind. Bob has triumphed over evil.